More than one has worn the mask and has discovered that with great power comes great responsibility. Kids can imagine suiting up like the web-slinging, wall-crawling super hero Spider-Man with Spider-Man figures, vehicles, and roleplay items! (Each sold separately, subject to availability.) Spider-Man is a kid favorite and shows that even a young hero can make a big impact when it comes to saving the world. Imagine training alongside Miles Morales with the Spider-Man: Into the Spider-Verse Shockstrike Miles Morales Spider-Man electronic figure! Kids can use the included gauntlet to turn the figure to face different directions and activate blasting action to get ready for the next Spider-Man mission! 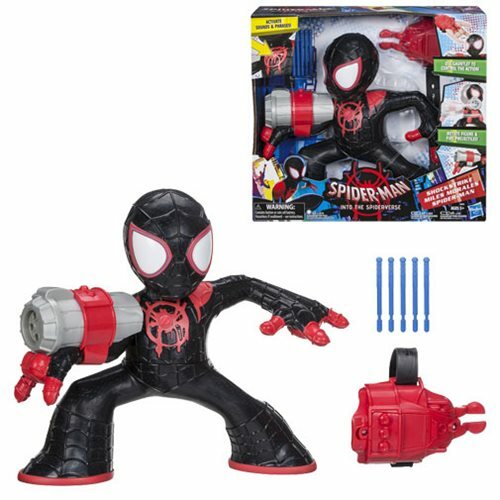 Featuring light-up eyes, 20 phrases and sound effects, and 5 web missiles that fire single shot or rapid fire, Shockstrike Spider-Man is ready to defend his turf or take down the opposition! Team up with the web-slinging, wall-crawling hero Miles Morales to battle the villains and imagine the adventures of Spider-Man: Into the Spider-Verse! Includes 10-inch tall figure, 5 projectiles, gauntlet, and instructions. Ages 5 and up.